Back in the day, qayaq builders used sharp stones and basic metal tools to cut driftwood for frames. Needless to say, this would take awhile. We’ve modernized the process just enough to fit our workshops in 9 short days. 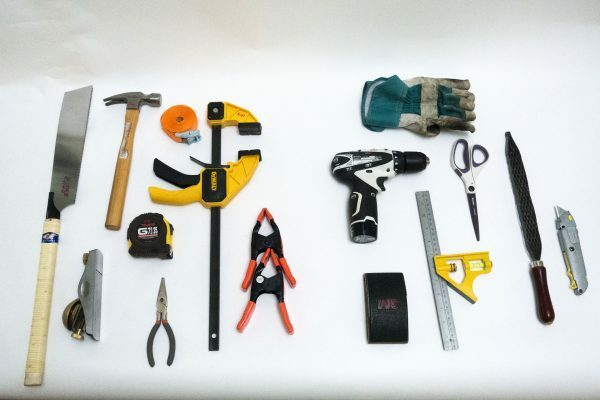 Below is the list of hand-tools each participant is responsible for bringing. We have done our best to distill down only the necessary tools for each person to bring, while the majority of tools and materials are supplied by us or our workshop host. Our hope is to cut down on the personal cost for our students, while keeping our workshops efficient and running smoothly! The Japanese saw is more often than not the least familiar tool for builders. After this workshop, you’ll want to use it all the time! They are excellent, precision saws for all manner of projects. Japanese saws come in all types: flush-cut vs. ribbed, oneblade vs. double-sided, big teeth vs. little teeth, high TPI (teeth per inch) vs low…the options can be overwhelming. Saws with little teether are better for ripping along the grain, while big-toothed saws are best for crosscutting. In a perfect world, you would have 3 different saws in your arsenal — but one all-around saw will do the job. For the workshop, the best saw will have a 19-23 TPI, a spine, and no flush-cut tip. With all this sawing, you need to be able to clamp stuff down. QuickGrip clamps allow you to clamp and reposition quickly and painlessly. For the workshop, look for a set of minimum 12 inches. Many of you will have an early love-hate relationship with the block plane, that we hope will turn to love-love as you see how well it shapes your paddle. Used for trimming the gunwales as well. Spring clamps are endlessly useful during the workshop. Look for clamps with 2″ opening, preferably metal as it is much stronger than plastic. Great for grip-strength training! Example from Harbor Freight. 12′ (4 meter) minimum, though a tape as long as the kayak is always useful. Pegs, pegs and more pegs! Believe it or not, you’ll want these for the sewing stage. Good notes will help you day-to-day as well as for future builds. We cap every workshop with a paddle on our final day. Please be prepared for a short paddle in seasonal weather. If you do not have kayaking drysuit, bring warm, synthetic layers. Even on calm water, plan to get wet. Water shoes or bare feet only in the kayaks. Everyone must have a PFD (lifejacket) to paddle with the group. I am putting this last because it is most important! There is nothing sadder than ruining your favorite cat sweater or sweet light-up sneakers with sticky polyurethane. While not required for every student, if you have these items lying about, pop them in your bag! * = tools that almost made it onto the MUST HAVE list. We do our best to keep costs down for students, so if you’re prioritizing these are the tools you want. We use these everyday, so the more the merrier! We bring all the bits you need. We’ve been told combination squares should be required. We don’t mind sharing, but this is one of the more useful tools for your kit. In absence of a combo square, a short ruler will helpful. Example on Amazon (Imperial). A fine cabinet rasp or Shinto rasp will make your life easier for shaping your stems and paddle. It’s nice to stay organized and keep track of your own tools. Bags with a detachable strap allow you to hang your kit from a sawhorse. Or just a 5 gallon bucket! We recommend labeling your tools, as many of you will have the same brands, and we encourage sharing. While a piece of wood will do the trick, these blocks make the job far easier. Be sure it’s a full 3′ or 100cm stick. Everyone loves a good straight edge! A pair of work gloves will save your fingers will sewing and lashing. Our favorite: this DIY version using cheap gardening gloves! Help save your fingers during the sewing days, recommended by kayak builders and surgeons alike. Certain creature comforts make the workshop more comfortable and fun. After 8+ hours on your feet, the dogs start barking. We do our best to supply tea and light snacks! For those who plan on building another kayak after the workshop, visual notes are indispensable. We have had students film nearly every demo step of the process, so long as it doesn’t slow down the class. Bring yours, or you’ll be forced to suffer through ours.